Even though Norway is not an EU member state, Norway's legislation on occupational safety and health is "in accordance" with the EU Framework Directive 89/391, which is set in place to protect the health and safety of workers. (reference). Basically this means that Norway's national regulations regarding manual handling operations is very similar to those of EU member states and is built on many of the same models (just like what is the case with the non-EU country of Switzerland). Anyway, this page intends to give you quick and to-the-point insights into manual handling authorities, safety laws, ergonomic guidelines and good lifting practices in Norway. 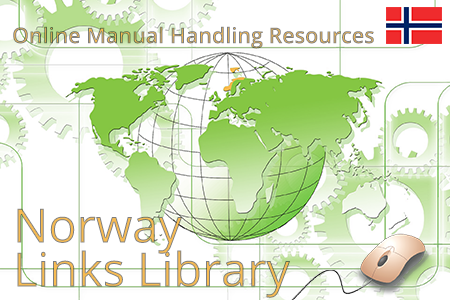 An introduction to the authority managing and the laws pertaining to manual handling in Norway. Ergonomic guidelines and good practices for manual handling operations in Norway. Weight lifting limits to lifting, pushing and pulling at work. Links out to both simple and more extensive ergonomic risk assessment tools for the manual handling of loads. In Norway we have the government agency the Norwegian Labour Inspection Authority / Arbeidstilsynet who is responsible for ensuring that companies and organizations follow the national occupational safety and health legislation, which in Norway is called the Norwegian Working Environment Act / Arbeidsmiljøloven. (The Norwegian Labour Inspection Authority also constitutes the national Norwegian EU-OSHA focal point). The Norwegian Working Environment Act outlines employers' responsibilities and duties towards their employees and is set in place to ensure a good and meaningful working environment along with protecting the safety and health of workers. Avoiding or at least reducing the risk of occupational hazards such as accidents and injuries sustained from manual handling operations is an important part employers' responsibilities. 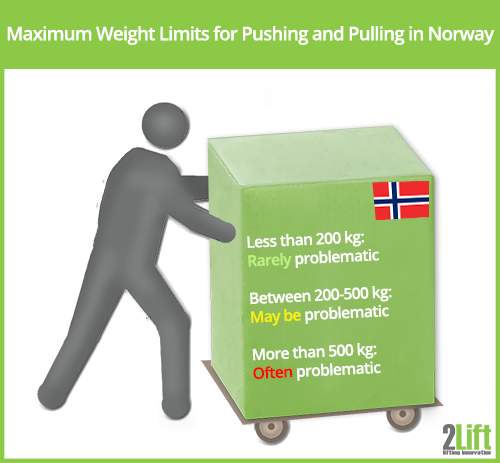 If you're curious to find out more about Norwegian employers' responsibilities regarding the manual handling of loads as it is stated in the Norwegian Working Environment Act, you can read about them here: § 23-1. Risikovurdering ved planlegging, utforming og utførelse av manuelt arbeid. The characteristics of the handling task (frequency, transporting distance, variation, pace etc.). It is also the responsibility of the employer to perform ergonomic risk assessments of potentially risky manual handling operations. And if a manual handling task 'falls short', meaning it is seen as endangering the worker's health, the employer must take corrective actions to eliminate or reduce the risk. This can be done by e.g. introducing mechanical manual handling aids and equipment. If your company is considered to be in a potentially 'risky' line of business in relation to your workers' occupational safety and health, the Norwegian Labour Inspection Authority may tell you that you need to coorporate with an approved bedriftshelsetjeneste (BHT), which is a a 'corporate health service' who will then monitor your working environment to make sure it lives up to the required standards as stated in the Working Environment Act. Fortunately the Norwegian Labour Inspection Authority has a certain amount of employer-orientated, easy-to-read material on ergonomics and manual handling available online where they provide simple guidelines to follow and tools to use for a quick risk evaluation (we will go through this next). There are also more extensive risk evaluation tools available, which are not Norwegian in origin, but are written in Norwegian. These are also published by the Norwegian Labour Inspection Authority (we will link out to these in the risk assessment section further down). Most material, however, seeming only exist in Norwegian. 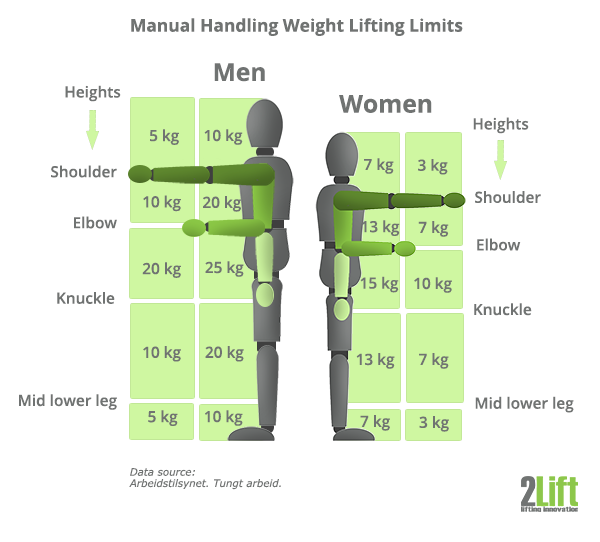 As you may already be fully aware of, the manual handling of heavy objects such as lifting, carrying, holding, pushing and pulling loads, may put the muscle, joint and skeletal system under stress and thus may over the long haul lead to injuries such as MSDs (musculoskeletal disorders). In order to avoid such health risks, employers are required to follow certain ergonomic guidelines for manual handling operations. - thus to avoid the manual handling of heavy objects completely! - the work must be re-organized so that the worker is exposed to as small a health risk as possible. The primary way to organize the manual handling task in such a safe and healthful way is to use technical equipment such as appropriate lifting and handling devices. In Norway (as is the case in many other countries) there are certain weight limits as to how much you are recommended to lift at work (manually, without the use of anything else than your own body). Objects weighing 3 kg or less is considered safe under most circumstances. At about a forearm's distance from the centre of the body (app. 30 cm). If the conditions are less than optimal, the weight of the load must be reduced. The handling takes place in a challenging working environment characterized by e.g. restrictive working spaces, uneven or slippery floors, too high or too low temperatures etc. A manual handling task is repeated too frequently, at too high a pace, with too little variation, with too little rest etc. If pushing and pulling a load is required, there are also limits as to how much many kg it is recommended that transport. More than 500 kg, it is "often problematic"
Between 200-500 it "may be problematic"
Less than 200 kg it is "rarely problematic"
As already mentioned, it is the responsibility of the employer to ensure a safe and healthy working environment for their workers. One way to do this is to perform ergonomic risk assessments of manual handling operations to make sure that the tasks do not constitute health risks. The Norwegian Labour Inspection Authority has created several risk assessment sheets with the aim of identifying safety and health risks at the workplace. They, among other things, state that three simple questions may be enough to start a risk evaluation process of working tasks. What can we do to reduce the consequences if it does go wrong? As an employer you may not have extensive insight into ergonomics, plus you may be busy and don't find that you have the time to eat your way through heavy documents to extract practically applicable information. Luckily the Norwegian Labour Inspection Authority has created some very simple tools for employers. Easy and user-friendly models of how much it is recommended that you lift, push and pull may be found here. (please note that if you scroll down the page quickly you won't see the models, they only appear in drop-down menus). These models use a simple color code (red is high health risk, yellow is potentially risky, and green is fairly safe) to communicate how risky a certain manual handling task is. If the manual handling task falls into a risky zone, it is recommended that you carry out further risk assessments. If you want to be thorough and have a little more time to dedicate to risk analysis, there are more extensive tools for you which entails filling out an ergonomic risk assessment sheet. These ergonomic risk assessment tools are what safety and health professionals may use. Their origin is not Norwegian (German and British, respectively), but the Norwegian Labour Inspection Authority has published Norwegian versions intended for Norwegian risk evaluation professionals e.g. for those within Bedriftshelsetjenesten (BHT). Even though the main target group is professionals, this risk assessment sheet is fairly simple to fill out. The kind of lifting activity (lifting, holding or carrying) you want to evaluate along with its frequency (for lifting), duration (for holding) or distance (for carrying). When filling out the sheet, each element is attributed a value, all of which together constitute a risk score. If the risk score is lands somewhere in the yellow or red area, further analysis and corrective actions are advised. This tool works in basically the same ways as the one above except that the steps to follow are different and related to pushing and pulling. The length of the transport activity (short or long) along with its frequency (for short distance) or total distance (for long distance). The KIM methods is developed by Federal Institute for Occupational Safety and Health (BAuA) and Länder Committee for Occupational Safety and Health (LASI). In our view, the MAC tool is a little more technical and comprehensive to use than the KIM method, but other than that, it works in a very similar way. The lifting task is pinned out in steps with different scores according to the perceived risk, and at the end all values are added together and provide an overall risk score which may or may not require further action. The MAC tool is developed by Health and Safety Executive (HSE) and Health and Safety Laboratory (HSL) in the UK.